Alicia White Daily creates stoneware pottery pieces that are fun to use. All the pieces are cookware and table ware. They can be used in the oven, microwave, and dishwasher. Choose a design, email the artist, and design your own piece! Put your horse, dog, cat or favorite saying on a mug or bowl or lamp or fountain. Or shop the gallery for Alicia's own favorite creations. 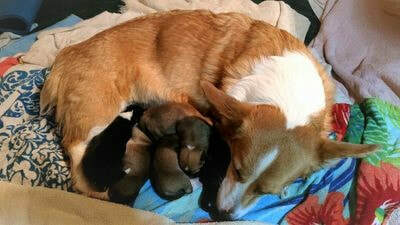 We also breed Pembroke Welsh Corgis! We breed to champion sires of Triple-H Corgis.